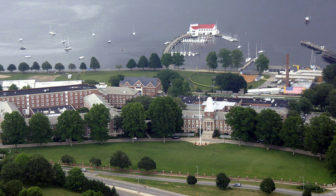 Washington – An investigation into the Coast Guard Academy’s treatment of minority cadets continues months after members of the U.S. House and Senate pressed the service for more information about racial disparities. A group of lawmakers in June asked Coast Guard Admiral Karl. L. Schultz to provide them “with all documents, including authority memoranda, investigative reports, panel sheets, final action memoranda and post-investigation talking points” regarding allegations of harassment or bullying made by any student or faculty member of the academy during the past three years, as well as the results of any investigations conducted to examine these allegations. Rep. Joe Courtney, D-2nd District, Connecticut’s U.S. senators, Chris Murphy and Richard Blumenthal, and Reps. Bennie Thompson, D-Miss. and Elijah Cummings, D-Md., asked Schultz to respond within 30 days. But the process of retrieving information from the Coast Guard about the allegations of the treatment of minority cadets has taken months, and the investigation is still ongoing. The Coast Guard Academy says it currently has 1,073 cadets. Six percent are African American and 10 percent are Hispanic. That compares to 12.1 percent of the general U.S. population that is African American and about 17 percent that is Hispanic. The Coast Guard also says 7 percent of its cadets are Asian, while another 10 percent claim two or more races. As the ranking Democrat on the House Homeland Security Committee, which has oversight of the Coast Guard, Thompson has for years voiced concern about the treatment of minority cadets at the academy. The congressman’s spokesman Adam Comis said the Coast Guard’s responses to inquiries made by Thompson and the other lawmakers, “was incomplete,” heavily redacted and contained information the Coast Guard did not want made public. Courtney said additional information provided by the Coast Guard was appreciated, but the investigation of racial disparities at the academy continues. Schultz has agreed to visit the academy with the lawmakers before the end of the year to discuss the issue – and to review an action plan aimed at addressing allegations racial disparities the academy is expected to release soon. The academy declined to comment on the investigation, or on legislation that would change the academy’s admission policies. The Coast Guard Academy drew fire for its poor grades on a the “Equity Scorecard,” a study by the Center for Urban Education at the University of Southern California that tracks academic data, including graduation rates, by race, ethnicity and gender. The scorecard also said black cadets suffered from a disproportionately higher share of disciplinary actions. “It is critical that the Coast Guard respond effectively and decisively to the Equity Scorecard results,” the group of lawmakers wrote Schultz. Last week, Thompson introduced the “Coast Guard Academy Improvement Act,” which would, among other things, require half of the members of an incoming class be nominated by the vice president and members of Congress. Unlike the other military academies, the Coast Guard Academy does not have congressional appointments. Thompson said academy cadets come “disproportionately” from the coastal areas where the Coast Guard is stationed or has training facilities and more geographic diversity is needed. Murphy said he is “eager to study whether selecting students through a congressional nomination process — like we do for other service academies — could help get us closer” to the goal of more diversity at the academy. Thompson’s bill would also establish a panel to determine the “cultural competence” of the academy.